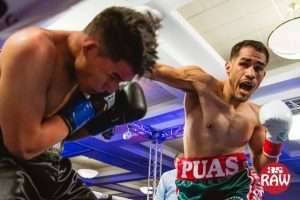 A packed house at The Burbank Marriott Events Center played host to Bash Boxing’s latest incarnation of Valley Fight Night on Friday April 20, 2018. The promotion’s industry wide reputation of stellar matchmaking did not disappoint once again. Nearly every fight on the 8-bout show was a brawl, featuring 6 decisions that were book-ended by KOs. Friday’s show was also broadcast CBS SPORTS DIGITAL’s OTT service, CBS SportsLive. In the featured bout of the evening, Burbank’s own Damien Lopez won a hard earned TKO victory over Rodolfo Gamez in a welterweight battle. 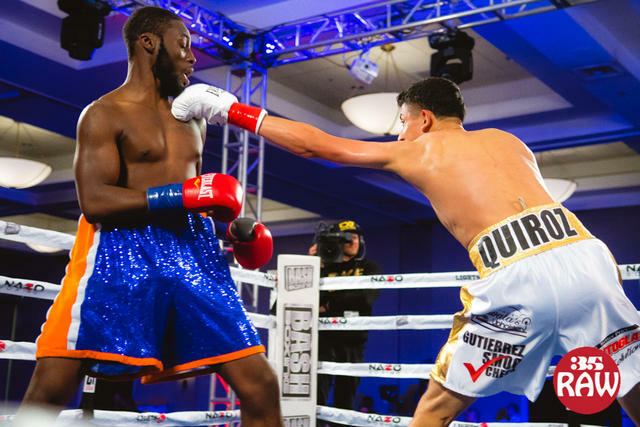 Gamez showed the same toughness that led him to an upset victory over previously undefeated Ronnie Biggers on the last Valley Fight Night show. But this time Gamez was clearly bothered in the first three rounds by the local favorite’s body shots and relentless attack. The referee kept a close eye on things at the end of round 4, as Gamez was taking punishment along the ropes. Only 8 seconds into the 5th round of a scheduled 6, Lopez dropped Gamez with a left hook and the bout was waved off. Lopez moves to 5-0-1 with 3 KOs. Gamez, who has now fought an undefeated fighter in all 7 of his professional bouts, drops to 2-5. In the co-feature, another welterweight battle took place. This time between young unbeaten prospects with decorated amateur backgrounds. Egis Klimas, manager of Vasyl Lomachenko and Sergei Kovalev among others, brought a new prospect into the Bash Boxing ring. Kazakhstan’s Sagadat Rakhmankulov won a unanimous 6 round decision, moving to 2-0- 1KO, over Bogota, Colombia’s Jhon Sanchez Leon. Leon (3-1- 2 KOs), who was coming off two consecutive wins over undefeated fighters, tried many different approaches and had some offensive success. But steady work, round by round, was done by Rahkmankulov. Leon definitely proved to ringside observers that he belongs at a high level in the sport. But the Kazakh, who is now boxing out of Oxnard in the Lomachencko camp, trumped the Columbian’s efforts on all 3 scorecards. In a stunner, Jesus Cruz Bibiano (17-13) was awarded a controversial 6 round decision over previously unbeaten Humberto Velasquez (6-1-2). Southpaw Velasquez seemed to outwork Bibiano in most rounds, although the former WBF champion landed good counters and kept it somewhat close. The split decision, by 56-58, 60-54, and 58-54 went against “El Camaron de los Pobres (Poor people’s shrimp)” Velasquez. Lightweight Ricardo “El Conejo (The Rabbit)” Quiroz of Oxnard won a tough majority decision over spoiler Archie Weah. Weah used movement and gamesmanship to pull even on one card after 4 rounds. But the steady work of Quiroz took the decision on the other 2 cards. 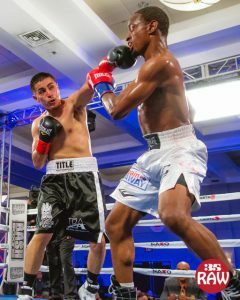 Weah (2-10) continues to impress against undefeated prospects, but Quiroz improves to 6-0. In 130lb action, Roger Gutierrez, of Pacoima, CA moved to 7-1-1 with 4 KOs with a unanimous decision over Jordan Baletero (2-6). Nearly all of Baletero’s wins and losses have come by KO. And after getting dropped in round one, it looked to be happening again. However, Baletero showed toughness and made it to the final bell, where he lost 40-35 on all cards. Gutierrez maintained a steady attack throughout to delight his faithful fans in attendance.